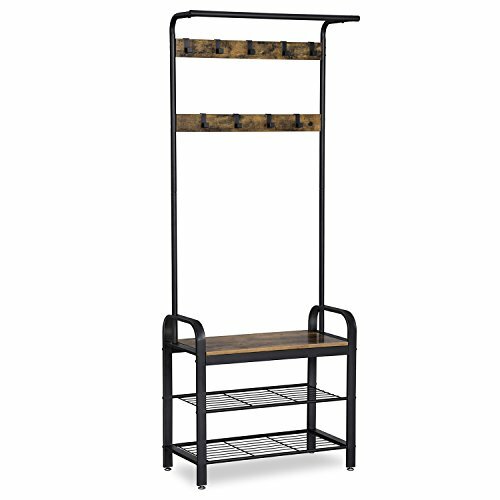 In the morning on busy workdays, a functional hallway rack can really help a lot. 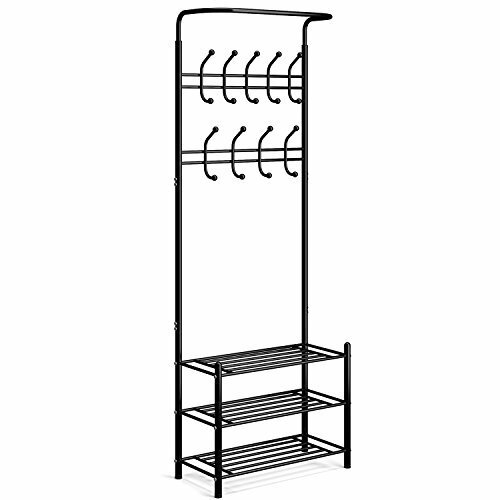 In order to save your money and room space, SONGMICS presents the brand new hallway rack which combines coat hooks, shoe rack and storage shelf perfectly. *Coat Rack - 9 removable hooks to keep your coats, keys, hats and scarves organized and easy to access. *Shoe Rack - The bottom metal shelves hold your daily footwear in one place, saving your precious time on searching and pairing. *Storage Shelf - The lower rustic shelf is perfect for handbags and storage bins, keeping the clutter out of your way. 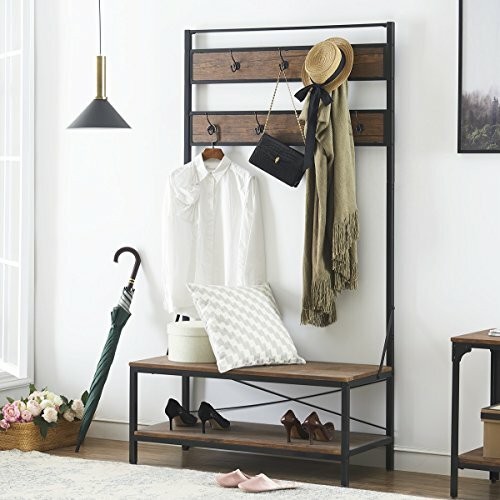 Take this eye-pleasing rustic rack home and welcome your guests with a clean and tidy hallway! 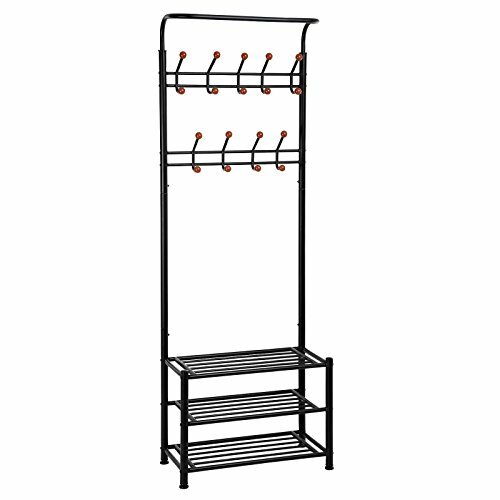 Specifications: - Material: Powder-sprayed metal tube, particle board - Size:28.3"L x 13.3"W x 72.0"H(72 x 33.7 x 183cm) - Load capacity of each hook: 6.6lbs (3kg) - Load capacity of lower board: 176lbs (80kg) - Color: black - Net Weight: 21.6lbs (9.8kg) - Gross Weight: 24lbs (10.9kg) Package Contents: - 1 x Hall Rack - 1 x Instructions SONGMICS Notes: - This product must be used with anti-toppling straps to ensure safe use. - Do not hang heavy clothing or other overweight items on the top rail. Keep your coats from getting damaged, and your shoes from getting lost by laying them around the house. 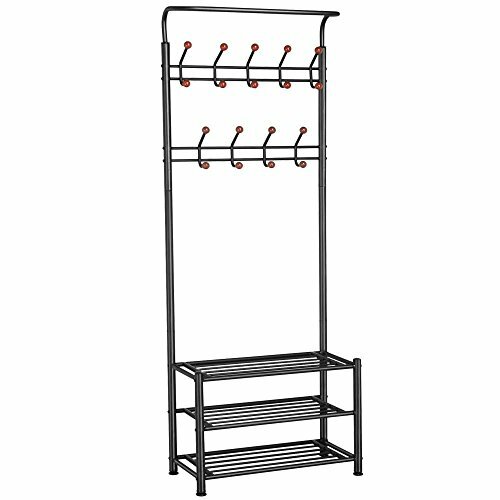 This coat and shoe rack will help organize your coats, shoes, bags, and more. Just put it near the door, and when you get home you can just take them off and place them on this. Combined with creative design and high quality, this SONGMICS doorway organizer is a brilliant solution to de-clutter & refresh your entryway or bedroom. 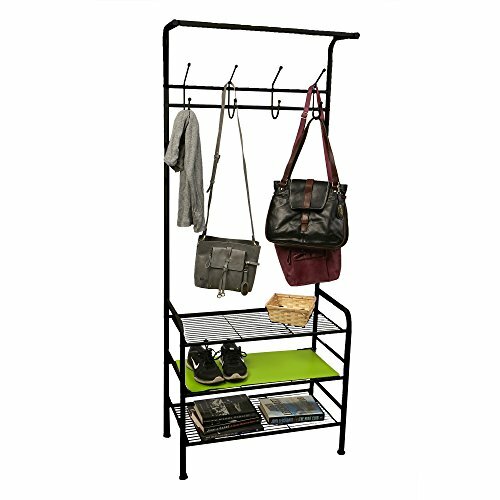 It features 3-tier shoe rack and 18 hooks coat rack to manage your different storage demands within less space. With this simple but stylish entry organizer, you can store up to 9 pairs of shoes in the 3 bottom shoe shelves. 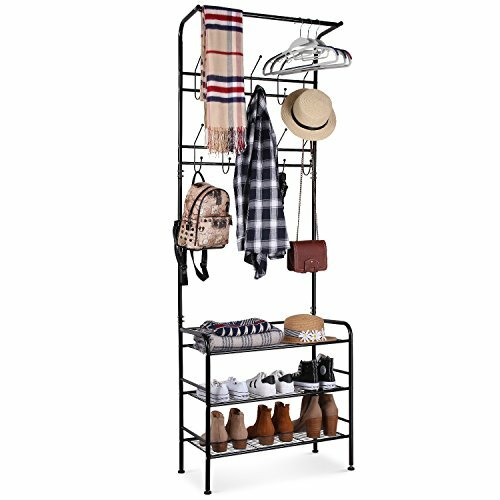 The top shelf is also great for your handbags, purses, storage boxes and more.Multiuse, durability and style, this coat rack organizer is definitely a great choice for homes & offices. Specifications: - Color: Black - Material: Black baking finish metal tubes - Assembly Required: Yes - Allen Key Included: Yes - Product Size: 26.4"L x 12.6"W x 72.9"H (67 x 32 x 185cm)- Shoe Bench Size: 26.4"L x 12.6"W x 18.1"H (67 x 32 x 46cm)- Vertical Layer Distance: 8.1"(21cm) - Product Weight: 14.3lb(6.5kg) Package Contents: - 1 x Hall Tree with Bench - 1 x Instruction - 1 x Allen Key Notes: - We do not recommend hanging clothes or hangers on top bar tubes. 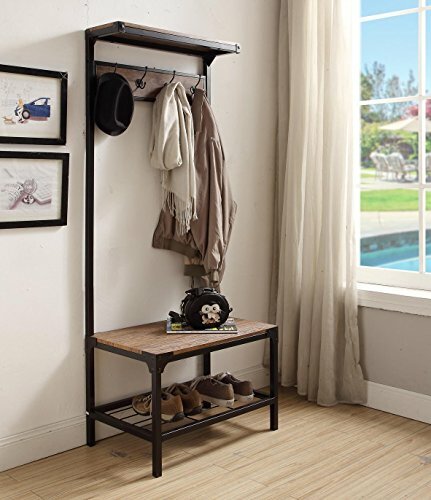 This Vintage Dark Brown Industrial Look Entryway Shoe Bench with Coat Rack Hall Tree Storage Organizer 8 Hooks in Black Metal Finish is a great addition to your home decor. Features 7 hooks for hanging hats, jackets, scarves, umbrella, etc. Also, comes with a bench seat, top shelf, and a shoe rack for extra storage. Measures: 68.5 inches high x 26 inches wide x 18 inches deep. Assembly required. 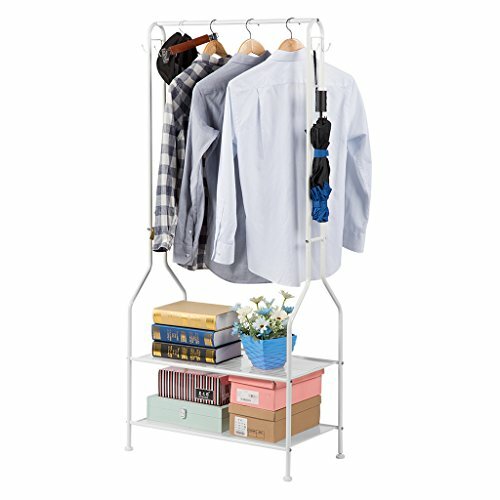 Looking for more Coat Shoe Racks similar ideas? Try to explore these searches: Oriental Comforter, Airbrush Step, and Wall Postcard.